Media »Democratic Diva: Did the GOP Corp Comm Candidates Violate Clean Elections Rules? Democratic Diva: Did the GOP Corp Comm Candidates Violate Clean Elections Rules? I got a curious mailer last week from the Republican candidates for Corporation Commission: Bob Burns, Bob Stump and Susan Bitter Smith. The timing was curious, for one thing. The three are unopposed in the Republican primary. Campaign cash is scarce for commission races. So, why waste the money now rather than husbanding resources to chase early ballots hard in the general election? The message was also curious. The pitch was that the Republican slate should be elected to stop President Barack Obama’s “radical energy policies” from driving up electricity prices. Primary election funds must be directed at the primary election. Nowhere on the hit piece does it even mention the primary. Bob Robb clearly felt it was directed at the general election when he got it, which was a perfectly reasonable conclusion. 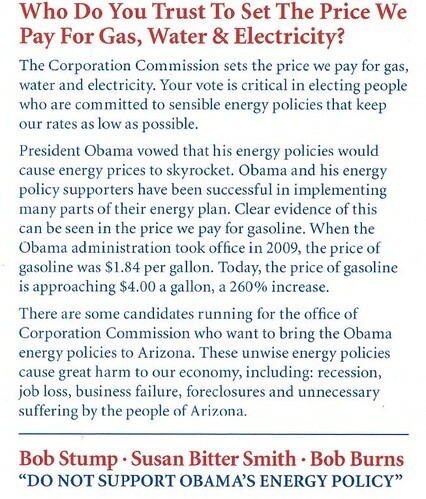 It slams our Democratic President and “some candidates running for the office of Corporation Commission who want to bring the Obama energy policies to Arizona”. In other words, the Democrats. Just who got this mailer, anyway? Was it mostly sent to Republicans or to independents as well? I’m very curious about that, especially since the deadline for independents to request a partisan primary ballot was August 17th. Not that there was anything on the mailer instructing independent voters about that. I’ll do a post later about why the GOP Corp Comm candidates and Robb are wrong about energy policy, probably after the primary. I just want to see if others agree with me that this mailer is sketchy and possibly a violation.